The Dell Inspiron 15 laptop is a sleek, lightweight and durable laptop, so you can slip it in your laptop bag or travel bag without losing precious space. The Inspiron 15 laptop features 15.6-inches HD, 1366 x 768 pixel resolution Truelife LED-Backlit display, the HD, TrueLife display delivers a clear, bright image that’s easy on the eyes. And this laptop powered by 7th generation Intel Core i5-7200U, 2.5GHz speed processor with AMD Radeon R5 M430 Graphics with 2GB DDR3 dedicated memory and comes with windows 10 operating system, 1TB storage drive with 6GB memory card. Save all your pictures, home movies, important documents and that funny cat video you have watched a million times on a large, hard drive. With up to 6GB of memory, you open and run multiple applications without freezing. Connect to your other digital devices through fast USB ports or an HDMI port. For quick and easy file transfers, there is also an SD card reader. Keep the conversation going thanks to the latest wireless options that give you get a fast, strong connection with impressive range. 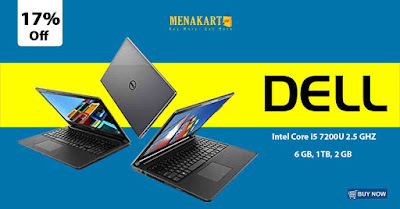 The Dell Inspiron 15 laptop is built with 4-cell removable battery, you cannot live your life next to an outlet and with at least 8 hours of battery life, you would not have to.